A bit of a random bonus. 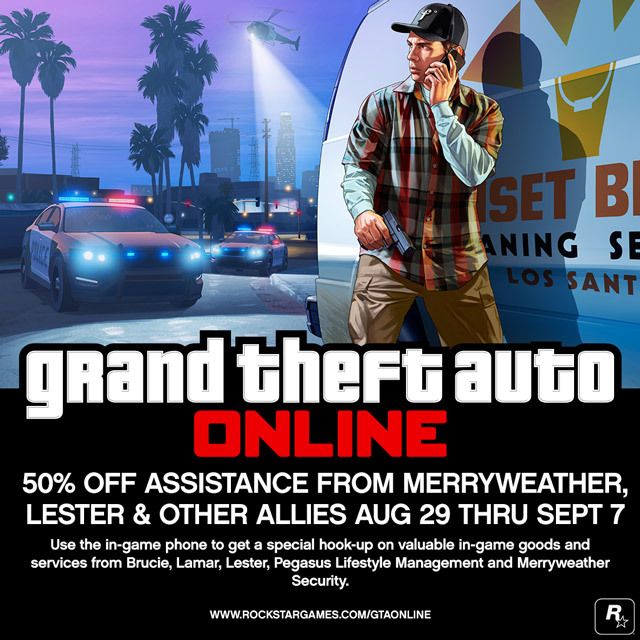 This week, calling for support from notorious friends in high places in GTA Online just got more affordable. So if you find yourself in need of backup, air support, transport or just need to disappear for a while, dial up any of your allies for a little "Roadside Assistance" and get 50% off the normal price. Rank requirements for these discounted services have also been removed but note that you will need to have received at least one call from each contact in order to use their service. Brucie: Stay alpha with Brucie's BullShark Testosterone, which doubles damage inflicted and halves damage received. Lamar: Call up Lamar and he'll send a mugger after any one of your chosen adversaries who'll lighten their wallet by stealing a portion of their cash. Lester: One of Los Santos' most connected criminals, Lester can help you avoid the fuzz by persuading them to turn a blind eye for a short period of time or clearing your wanted level. He can also locate transportation (cars, boats, planes and helicopters) or play tricks with the radar - revealing other players or masking your location temporarily. Lester’s normal GTA$1,000 fee for setting bounties on other players has also been slashed to GTA$500. Pegasus: Retrieve personal vehicles from Pegasus Lifestyle Management and have them delivered to your location. Merryweather: Access all the paramilitary services that Merryweather Security Consulting has to offer at this reduced rate, including ammo crate drops, helicopter backup, boat/helicopter pickup, airstrikes and even your own private army of vengeful mercenaries. These services can all be accessed via the Contacts menu on your GTA Online character's in-game phone. Discounts run until September 7th. Enjoy and join the fun at the GTA 5 forums!